A tantalising festival world awaits family and friends, as Russborough House in Blessington swings open its gates for its first EVER festival on the 28th - 30th June. 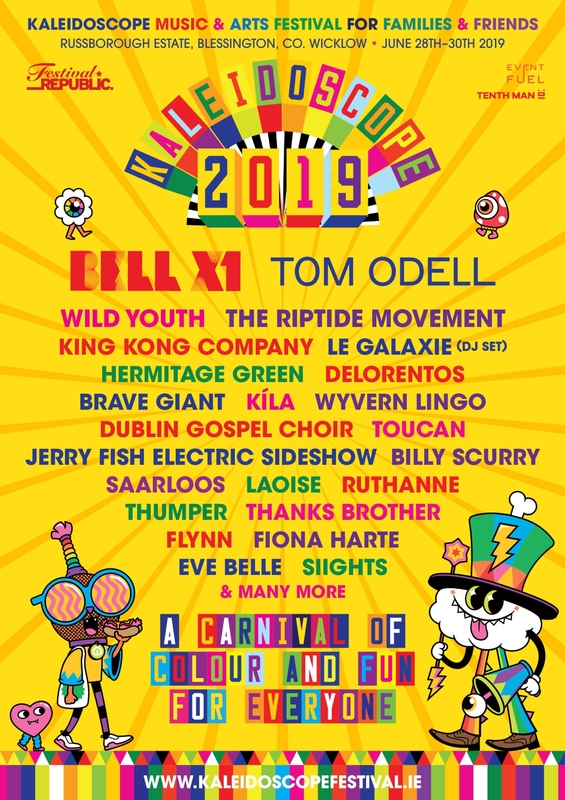 Kaleidoscope Festival will provide three days of high energy, full colour, multi-stage entertainment over 16 stages, designed to entice and enthral all, from babes in arms to those eligible for a bus pass! The music line-up for the festival has just been announced with top acts including BellX1, Tom Odell, Wild Youth, The Riptide Movement, King King Company, Le Galaxie, Hermitage Green, Delorentos, Brave Giant, Kila, Wyvern Lingo, Dublin Gospel Choir, Toucan, Jerry Fish Electric Sideshow – Billy Scurry, Saarloos, Laoise, RuthAnne, Thumper, Thanks Brother, Flynn, Fiona Harte, Eve Belle and Siights. Born out of Electric Picnic, Kaleidoscope harnesses the magic of Picnic’s entertainment and family campsites, tailoring the overall festival experience to the desires of the festival-going family and bringing the essence of Electric Picnic to a brand-new venue. Kaleidoscope heralds a new era of programming for the sophisticated taste of modern parents, discerning kids and all-knowing teens! Its extensive creative programme has been tailored to cater for each and every member of the modern Irish family. Kaleidoscope offers specific programs for ‘smallies’, for 4-8, 8-12 and 12-16 year olds, together with all the festival favourites for adults of all ages! Children and teen programmes will take place within Russborough’s walled garden and an utterly enchanting fairy fort located on the forest’s edge. Every element of the programme has been carefully selected because it is thought-provoking, interactive and inspirational, as well as hugely entertaining! We are delighted to welcome Fighting Words, Science Gallery and herpetological hobbyist Collie Ennis to the creative team - specialists and enthusiasts in their fields and world-leading innovators in inspirational learning. And that’s not all - parents with babes in arms can bust some moves in the Baby Disco. For the energetic at heart - a feast of urban and adventure sports, water sports, morning runs and other endorphin inducing activities. Sooth your mind and body with our wellnessprogram which includes meditation, Tai Chi and yoga. The woodland spa offers access to a selection of massage treatments, hot tubs and seaweed baths. The Scrumdiddlyumptious Festival of Food is a feast of fun for everyone! And all of this in addition to the arts festival favourites of theatre, spoken word, visual art, circus, cinema, comedy and music. Kaleidoscope is a veritable feast of full family participation! It is no accident that Kaleidoscope’s gates open the very day schools finish for the summer, giving families the opportunity to move straight from the classroom to the campsite and start their summers off with a bang! With years of festival experience under their belt, Electric Picnic, Event Fuel and The Tenth Man, can almost anticipate the needs and desires of family festival-goers. Entertainment, imaginative and programming is key, as is accessibility and setting. And Russborough delivers on all. An expansive 200-acre estate located just 20km from Dublin in Co. Wicklow, just off the N81, Kaleidoscope is designed to make the entire festival experience as seamless as possible. And with this in mind, for the first time EVER in Ireland, Kaleidoscope will also offer ‘Car Camping’, reducing the trek from the car to the campsite to mere feet! Extremely popular in the USA, ‘Car Camping’ simply means that you load up all of your gear for the festival in your car, pull into your campsite and set up your tent on a designated tent pitch beside your car, putting an end to the laborious tasks of carrying gear back and forwards to some remote location. And there will be the usual availability of Boutique camping and Pink Mooncamping that we have long come to associate with Electric Picnic. Melvin Benn is the Festival Director, Festival Republic. "As soon as Electric Picnic tickets go on sale, family camping sells out in minutes. It is a massively popular experience. We wanted to create a festival that caters to these festival goers, but also extend its appeal somewhat, so it is also of interest to the older sibling in the family or teen and families have a festival to go to once their kids are over 12. From the many years of catering for families at Electric Picnic we have learnt what really works," he said. Join Kaleidoscope Festival on the 28th, 29th & 30th of June for an absolutely epic weekend of family fun - let’s make memories! Tickets go on sale this Tuesday 16th April 9am from Ticketmaster. Weekend camping tickets for a family of four-2 adults & 2 children under 18years of age. Valid until midnight 1st May 2019. Subject to availability. ELECTRIC PICNIC LOYALTY DISCOUNT SCHEME EXTENDED TO KALEIDOSCOPE FESTIVAL GOERS!! Kaleidoscope Festival is delighted to offer a special discounted rate to those who have previously attended Electric Picnic. A 15 % discount (net of booking fee) is available to customers who have attended any 3 or more previous Electric Picnics. A 10 % discount (net of booking fee) is available to customers who have attended 2 or 1 previous Electric Picnics. Loyalty Ticket Codes will be sent via email by Ticketmaster to those who have opted in to receive communications from Ticketmaster. Those who have not opted in can apply to receive a discount code via the process outlined on the Kaleidoscope Festival website. Discount codes are valid for a limited time and will no longer be valid for use after Midnight on Sunday 12th of May. For full loyalty discount scheme terms and conditions please see kaleidoscopefestival.ie.